This post isn’t about search. It’s about me. 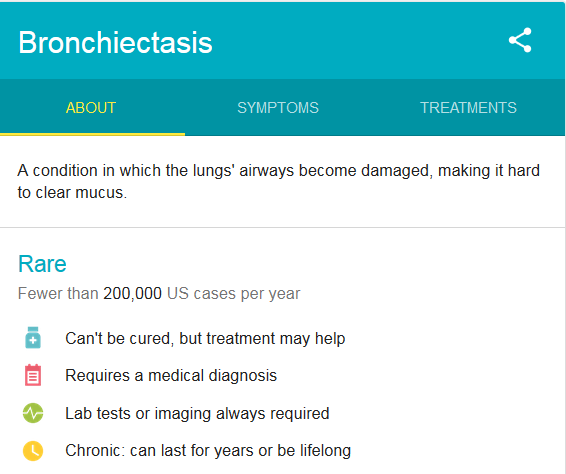 Six months ago, just before I left for SMX Advanced, I was diagnosed with bronchitis. No big deal – I’ve had it countless times throughout my life. I’ve dealt with asthma for 20 years. I’ve had a nagging cough for at least 5 years. I was a little tired before I left for Seattle, but I picked up my prescription for antibiotics and went on my way. By the time I left Seattle, I felt awful. Those of you with whom I had dinner the last night of the show may have noticed that I was exhausted, and I wore my jacket throughout the dinner because I was so cold. When I got home, I went to the doctor, who said I had pneumonia. Long story short, I spent most of July sick. After countless tests, CT scans, and x-rays, I was diagnosed with bronchiectasis. After trying multiple therapies, I now have a percussive vest to help clear my lungs – yes, the same thing they use for cystic fibrosis patients, and the old people in the photos on that website. I’ve got a super heavy medical device that I have to use for 30 minutes, twice a day. I’m halfway through my morning session right now, shaking as I type this. But this post isn’t a pity party. It’s to say how thankful I am for the blessings in my life. My husband and children, and my extended family, who have all been super supportive. My job, in which I’m blessed to work from home, where I didn’t have to take more than a half day off work during my worst days, because I could sit at my desk at home and rest when I needed to. This industry, which keeps me inspired and engaged, even on days when I’m too tired to do anything but work. I can still walk and go to the gym. My half marathon days are behind me, but I can still do 5Ks, if at a slower pace than before. I can still play the clarinet and saxophone – in fact, my doctors believe that playing a wind instrument has saved me from being much sicker, due to the expanded lung capacity and the vibrating of the instrument while I play, which mimics the vest and other therapies. I can still travel to conferences, although I may sometimes decline the evening networking to save my energy. I’m grateful for my friends in this industry, who have cheered me on and commiserated with me over the years. I love that although we’re spread out all over the world, we’re just a tweet away and can chat with one another about PPC challenges. So if I miss a week of blogging here and there, now you know why. I’ll leave you with a favorite song by the Monkees, As We Go Along. There’s still so much to do in the sunlight. I’ve seen a lot of posts out there recently with people giving advice to their 18-year-old selves. One I liked featured some of the top college basketball seniors, including one of my favorites, Michigan State’s Denzel Valentine. Tomorrow, my twins will turn 19. I don’t expect either of them to go into PPC – they’re not interested in it – but nonetheless, I was inspired to share PPC advice for my 18 year old self. I was an 18 year old hotshot. I did well in school and was good at a lot of things: sports, music, writing, and more. I thought I’d be a huge success right out the gate. The very next year, when I was 19, I took accounting. It was the hardest class I had ever and would ever take – including grad school, and that’s saying something. I studied for hours every night just to get a 2.5 in the class. A couple years later, my first job was a disaster. It wasn’t a good fit for me. I failed at it. But failing is learning. I learn far more from failing than I do from succeeding. At 18, I was afraid to fail. I can’t say I love it now, but I’m not afraid to fail. 18 year olds, don’t be afraid to fail. It’ll teach you a great lesson. Technology will evolve into something you can’t imagine right now. Let’s face it – I’ll be 50 next month. I was 18 in 1984. Google wasn’t even a gleam in Larry and Sergey’s eyes – in fact, Larry Page was an 11 year old student right here in East Lansing. The internet itself didn’t exist, at least not publicly. Computers existed, but were not commonly used. We had a Commodore 64 at home, but I didn’t have one at college. No one did. We hand-wrote term papers and then typed them on a typewriter. DVDs and iPods didn’t exist either – we rented VHS tapes and listened to music on Walkmans. Just the other day I was talking to my daughter about VHS tapes – she had watched the movie “Be Kind, Rewind” in her film class at MSU and thought it was funny. Even at 18, she remembers using a portable CD player and watching kids shows like Veggie Tales on VHS. A ton has changed in her lifetime, not to mention mine. My point is, the career you end up with may not even exist right now. Mine sure didn’t. Go with the flow. Learn skills that translate across jobs: writing, thinking, and analyzing will get you a long way in whatever career you choose. Be curious and ask why. PPC is like CSI – performance fluctuations are often a mystery begging to be solved. The answers are not going to be fed to you – you’ll need to dig them out. Learn how to research and ask questions. You should always be asking “why” – why isn’t this keyword performing? Why did that ad perform better? Why didn’t this feature work the way I thought it would? Critical thinking is a crucial PPC skill as well. Don’t believe the hype and hyperbole in the blogosphere – read, understand, test, and think for yourself. Don’t fall for gimmicks like “great PPC hacks” and “this feature is a unicorn” and other hyperbole. Some things you read or hear might work great; others will be a disaster for the accounts you’re managing. Learn to spot the BS. This advice goes whether you decide on a career in PPC or anything else. Find a mentor or teacher who will take you under their wing and show you the ropes. In every job I’ve ever held, I’ve tried to find someone to emulate. Sometimes it’s been a manager or boss. Sometimes it’s been a more senior coworker. In PPC, it’s often been colleagues I’ve met at conferences or online. The point is, find someone who is willing to answer your questions and give advice. Find someone whose actions you respect, and emulate them. Also be on the lookout for what I call “reverse role models” – those who show you what not to do. We’ve all had bad bosses and coworkers over the years. Take note of the things that upset you and make sure you don’t do them! My husband and I have always tried to teach our kids that there are good and bad people out there. You will not always get along with everyone. You’ll have bad teachers, bad classmates, bad sports coaches, and bad neighbors. Learn how to deal with these people in a mature and professional manner. We’ve never allowed our kids to quit or switch just because of a bad teacher or classmate. We’ve helped them learn to deal. This is perhaps the most important advice I can give. When I was 18, I wanted to be the next Jane Pauley. I loved television and everything about it. I was a telecommunications major at Michigan State and was convinced I had the smarts and the skills. I’d wanted to do this for as long as I could remember. Obviously, that didn’t happen. I’m not the anchor of NBC Nightly News. By the middle of my junior year of college, I realized I needed to be more realistic. But I didn’t give up on what I loved. My first job was in broadcast – selling advertising for a local radio station. I learned that I hated selling, but I loved advertising. I eventually got into marketing for a local company. It was there that I got into search when Adwords launched their CPC program in 2002. I’m doing what I love, even though my job now is something I couldn’t even have dreamed of at 18 in 1984. The moral of the story is, don’t give up on your dreams – but find something practical to pay the bills in the meantime. And be open to new directions. So much has changed since I was 18 – it’s literally a different world. What was once the stuff of Star Trek fantasy is now a reality. It’s amazing. So to all the 18 year olds out there, enjoy the ride. What would you tell your 18 year old self? Share in the comments! On Sunday, February 23, I was in the midst of a mundane task: putting away laundry. A loose piece of blanket binding on the bed had gotten looped around my leg without my realizing it. As I started to walk toward my dresser, the loop basically pulled the rug out from under me. I took a header into the dresser. My first thought was, “That’s the hardest I’ve ever hit my head.” And then the pain kicked in. To make a long story short, my husband took me to the ER, where I was diagnosed with a concussion. In a lifetime of playing sports, including risky ones like skiing, I get a concussion in my own bedroom. The doctor ordered a week of complete brain rest. I was not to watch TV, check email, play video games, or do anything but rest, really. I was dismayed at this news. As it turned out, though, I really couldn’t do these things anyway. Even forming a complete sentence was challenging those first few days. If someone was talking to me, I had to literally shut my eyes to be able to process what they were saying – any visual stimulus made it impossible to focus on the spoken words. As the days progressed, things got easier. I was able to read by Friday – thank goodness, as I’d gotten bored with sleeping all the time! By Monday, I was cleared to return to work. I thought I was in good shape mentally. And yet, I found that doing simple, routine tasks like preparing a report or reviewing Adwords or Google Analytics data was painstakingly slow and difficult. I made a few silly mistakes, too – I caught them before it was too late, but they were mistakes I normally wouldn’t have made. In short, my brain wasn’t 100%. While I was fine with physical activities like showering and making dinner, I struggled with mental tasks like focusing on PPC. At that point I realized how dependent we are on brain power in PPC. I knew that my brain was one of my most reliable tools for PPC, and yet I took it for granted. I know many of you agree. When I polled my Twitter friends about their must-have PPC tools, several of you said “my brain.” (That post is coming, I promise! I’ll update this post with a link when it goes live.) We rely on our ability to think, analyze, reason, and create successful PPC campaigns. And we don’t realize how powerful that brain power is until it’s lost. Thankfully, after just one day things got better. On Tuesday, my brain worked faster, and I made fewer mistakes. I didn’t get as tired. My brain “muscle” was getting stronger. It came back fast once I was ready. Today, I feel like myself again. The moral of the story here is that we all need to take a moment and be thankful for our brains. In this profession, they’re our most crucial tool. We don’t use hammers, saws, stethoscopes, or chemistry labs. We rely on our brains. Respect the PPC brain, my friends. It’s been a tough week. On Monday, April 15, the woes we all feel on Tax Day were set to be tempered by the annual excitement of the Boston Marathon. In a split second, the exhilaration of the day turned to horror when bombs exploded near the finish line. As a walking distance racer myself, these events stunned me. It was a similar yet different feeling to September 11. While of course 9/11 was horrific beyond belief, it wasn’t as personal to me. I never worked in the World Trade Center. I’d been there, but only as a tourist. The Boston Marathon is a race like many I’ve participated in myself. As a walker, I’ll never qualify for Boston, but I’ve crossed many a finish line and cooled down in the finish line area – just like the runners and spectators who were hurt and killed on Monday. The images that emerged on Monday and the days to follow were all the more upsetting because I could easily picture myself there. This morning, I awoke to the news that the manhunt for the perpetrators of this terrible attack has taken on Hollywood-esque proportions. If the attacks themselves were hard to believe, this is nearly impossible for my traumatized brain to process. How does this happen in America? But we’re a resilient sort. On 9/11, we bent, but didn’t break. 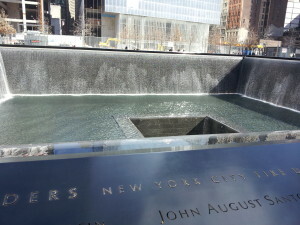 A couple of weeks ago I visited the 9/11 memorial. It’s a stunning example of turning tragedy into something beautiful. And we’ll do it again. On Sunday, I’m participating in the Lansing Marathon Half, along with my husband and son. I’ve been training since January and I’m not about to give up. Giving up lets the bad guys win. And we’re not about to let that happen. No, this isn’t me, but I wish it was. During the last couple months, I’ve been doing a lot of stretching. I’ve been literally stretching my tired muscles as I train to walk my second half marathon. I’ve been stretching mentally at work, too. I’m a month into a 3-month project where I’m covering for a coworker who’s on maternity leave. It’s been a great experience so far – I’m not one to shy away from new challenges, and this has definitely been a challenge for me. One of the great things about stretching is you learn how far you can really go. Walking a half marathon teaches you that you can walk farther and faster than you ever thought possible. In my project role, I’ve learned a few things too. Rushing the job never works. If you’re doing a 10-mile training walk, you need to allot enough time to complete the distance. I know I can’t cover 10 miles in an hour, so I don’t even try. Sure, you can (and should) push the pace a little, but I know my limits. If I don’t have 2 ½ hours free, I know I can’t do 10 miles. The same thing goes for work. As with any new project or set of responsibilities, the sheer length of the to-do list tends to create a sense of urgency. It’s easy to fall into the trap of hurrying through a task to pare down the list. I’ve always known that a rush job is never your best job, but this project has been a big refresher course in slowing down. It’s better to make sure everything is right than it is to race through everything as fast as you can. Luckily, I avoided major stumbles, but I was perilously close a couple times and it wasn’t fun. Love what you do – or fake it till you make it. Last year I walked my first half marathon. I had 2 goals: finish the race, and not come in last place. I’m proud to say I accomplished both goals! When I started training for this year’s race, I set some more aggressive goals that required some heavy-duty training. I’m not gonna lie – there were times that I really wanted to slow down or cut the distance short. But I kept going. And eventually, I found that I enjoyed pushing myself! When it comes to PPC, I’m the luckiest person on earth because I get to do work that I love and get paid for it. It doesn’t feel like work. In this project, though, there’s a lot more client contact than I had before. While I love talking to clients, it can be challenging to be in meetings for 6-7 hours a day. So, I took the same approach as I did with the marathon: faked it until I made it. It didn’t take long – maybe a week tops – to feel comfortable, but I’m sure if I’d copped a poor attitude, I’d still be struggling. And really, it’s easy to talk to people. If you treat everyone as though they’re just the person you wanted to talk to, the conversation will be smooth and pleasant. If you take 5 seconds to confirm receipt of an email, you’ll ease worries. Simple things, to be sure, but they work. The half marathon is a week from Sunday, and I know I’m ready. And I’ve hit my stride on my new project, too. It’s always good to stretch. I know I haven’t blogged much lately. The end of summer always gets crazy for me. Every year, I say “Next year, I’m taking the whole month of August off,” but of course that’s not likely. Back in 2006 when I started this blog, I didn’t know if I was going to keep up with it. It was really just a fun experiment at the time. There weren’t many free options for blogs back then – really, Blogger was the only one. So that’s who I used. Fast-forward to 2012, and I’m finally ready to take the plunge into WordPress. I’d used WordPress for client blogs & sites, so I was familiar with it; and I’d had my own domain for a long time, so I was ready. So, make yourself at home and explore! And let me know what you think! If you’re friends with me on Facebook, or if you follow me on Twitter, you’re probably aware that I saw Van Halen in concert in Detroit on Monday – in the front row! I’ve been a fan of theirs since the early days, and this was my first front row experience. It was amazing. My husband took this picture, along with about 100 other awesome photos, at the show. 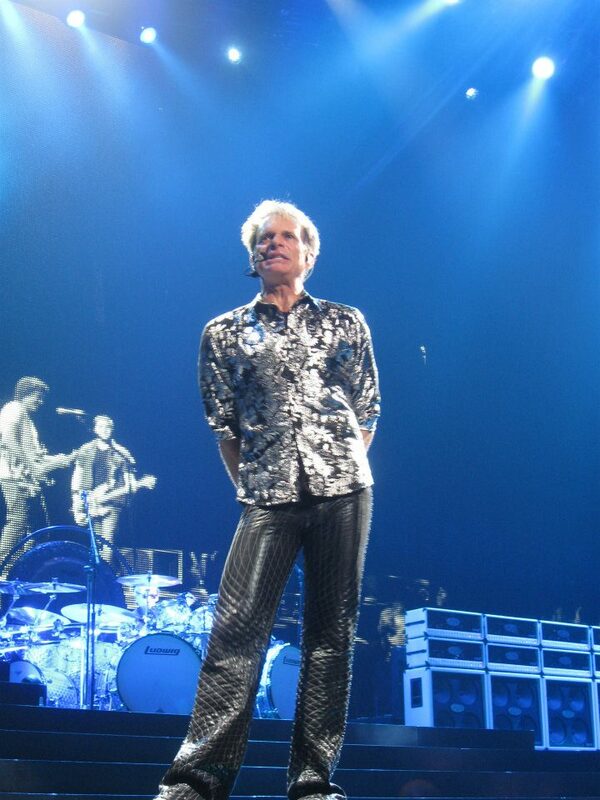 The big deal about this tour is that it’s following the band’s first album with David Lee Roth in over 28 years. As part of their new foray into social media, the previously closed-mouthed band has published several video tidbits that are really cool and fun for the fans. Some of my favorite tidbits are the interviews with the 3 founding band members. In one, the guys discuss how the process of making an album has changed over the years. One thing that’s different now is that instead of cutting the vocal track by singing the entire song all the way through, the vocalist will sing one phrase at a time, over and over. Then the producer chooses the best take from the 20 or so takes of that phrase. I tell them to sit down at their computer, think of a topic (any topic), set a timer for 15 minutes, and write. If you can’t get at least a draft of a post in that time, it’s not blog-worthy. Beyond 15 minutes, you’ve thought yourself past genius. This goes for anything creative: blogging, photography, music, speaking at conferences, ad copy writing…. The list goes on. The first take is probably going to be your best one. So if you’ve always wanted to blog but thought you didn’t have time, start writing now – before you think yourself past genius. And if you’re interested, here’s the whole VH interview clip; the genius quote is almost at the end, around 12:00. Yes, You Can Do SEM From Home! Everyone knows that telecommuting has become more commonplace lately – even more so with gas upwards of $4 per gallon. And yet, a surprising number of companies here in the US have not yet embraced the work-from-home concept. For me, working from home most of the time is a must. In addition to being a PPC pro and working on a lot of great clients, I’m a busy wife and mom with a full life outside of work. I live about 80 miles from our company headquarters, so rather than make the 3-hour daily commute, most of the time I work from home. This way, I’m more productive (and I stay sane). More productive, you may ask? What with all the distractions calling my name: house work, the TV, the stereo, the Wii, my children…..
First off let me say that I hate house work, so that is not a distraction at all. I watch almost no TV. My kids are at school 8 hours a day, and I save RockBand for the weekends. But still, it can be challenging to stay productive without the watchful eye of a boss or coworker staring me down. So what does it take to be successful working from home? Here are the keys for me. Act like you’re going to an office, even if you’re not. Believe it or not, I get up at 5:30 in the morning, even though I have no commute. Partly that’s because my kids are out the door by 7:20 am, and I want to see them off – but mostly it’s because I still get ready for work, even though “work” is at home. Get up at the same time every day (it doesn’t have to be 5:30 – that’s just what works for me) and get dressed in decent clothes. Eat a good breakfast. Fix your hair and put on makeup (OK, that’s just for the gals out there – right?). Put shoes on your feet. Yes, shoes. You wouldn’t go to the office in flip flops or bunny slippers – so don’t wear them at home. All of this preparation puts you in the right mindset to approach your work day in a professional manner. I know people who can work an entire 8 hour day sitting on their couch with their laptop in their lap, or hunkered down in a coffee shop. And in many ways, that’s one of the biggest benefits of working from home – you can pick a spot that’s comfortable, and it can be a different place each day. For me, though, I need a real desk, with a real desk chair and a real keyboard. Yes, my work computer is a laptop, but I use a port replicator to enable me to use a full-size monitor and ergonomic keyboard and mouse. Working with a laptop in my lap at search conferences is fine, but doing that day in and day out, for me, is a recipe for unbearable back and neck pain. But I digress. The point is, have a regular space to work, even if it is your living room. Again, you’ll be in the right frame of mind, not discombobulated from working in a different space every day. Another great benefit of working from home is the fact that your work is always there, so you can do it whenever you have a chance. This is a boon for busy moms like me who might have to cut off early for a school event, or take someone to the dentist in the middle of the day – it’s easy to catch up early in the morning or after the kids go to bed. But this can backfire on both ends: it can be tempting to short-change your work for all the other stuff in your life; and it can also be tempting to work every spare minute of the day (and night), just because it’s there. Don’t fall into either of these traps. Establishing regular work hours not only helps you maintain a work-life balance, but it lets your coworkers and clients know when they can get a hold of you. That’s not to say you can’t ever stray from your normal hours – work life and home life both demand this at times – but having a set schedule will keep you from getting that 10pm call from your boss wanting to chat about an idea, or an 8am call from a client while you’re trying to get your kids onto the school bus. For tons of great articles on working remotely, check out Web Worker Daily. Their blog is another daily must-read for me.